Vera Tsotsos is a ward clerk at The Scarborough Hospital. After 19 years on the job she received notice in the spring that her full-time position would be eliminated. Her last day is today. “I would not recommend my job to my daughter or my granddaughter,” says Tsotsos, who sees the damage done by the constant insecurity her colleagues face. While she could have likely moved into another opening at the hospital, she chose to leave instead. “I had enough,” Tsotsos told us. Hospital support workers require considerable skill and training to do their jobs effectively. Yet they are often the first to be let go when money gets tight. Ontario hospitals are shedding jobs to balance years of zero-based funding from the provincial government. In the process, they are also sending years of valuable experience out the door. It’s time that the OHA and the Ontario government come clean and reveal the real cost of their austerity agenda. In the coming weeks we will be highlighting some “straight talk” from OPSEU’s hospital support workers that features the work they do and the challenges they face doing their best to serve the public. 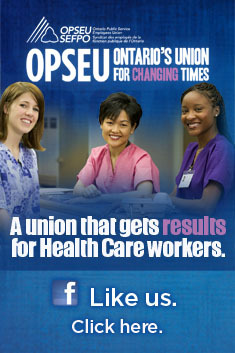 The first series of vignettes was shot at OPSEU’s annual convention in May. This entry was posted in Uncategorized and tagged Straight Talk series, The Scarborough Hospital, Vera Tsotsos, Ward Clerk. Bookmark the permalink. I strongly believe it is time for the government to get out of the health care game. They don’t allow private clinics and hospitals, so people have no choice but to go to the government run dog and pony show. Don’t miss it at and emergency department near you! Since they have a monopoly on health care delivery, they have a fiduciary obligation to deliver effective, efficient quality health care. We are miles away from that in Ontario. It is downright criminal how many people die or end up permanently disabled because they were sent home from emerg when they should have been admitted, they have to wait too long for a procedure, and because mistakes are made due to under staffing, lack of safety checks, and adequate supervision of new and inexperienced personnel.They have let all the experienced people go so they can hire cheaper replacements or no replacement at all, and they closed all the psychiatric hospitals under the pretext of a community based recovery model. What they didn’t tell the public is that the government’s concept of community based is living on the streets. The handling of mental health care in this province over the past decade has been abysmal and continues to deteriorate. The people of Ontario should be demanding healthcare reform, but we are an apathetic lot until it happens to us. Well, I’ve witnessed more than my fair share, and all I want is a choice. If I want to mortgage my house so that my mother can get a scope done in six days instead of six months, I should have the right to do that. This is not freedom. This is totalitarianism. And that’s exactly what some people want you to believe so they can further privatize the system. The only thing is we hope you’ll have lots of very expensive private insurance, because the United States has taught us that this kind of system is very expensive and leaves a lot of people behind. And even when there is a parallel public system, the waits get longer because the resources are siphoned off from the public system.